Graphic design case study of the art direction, visual identity, branding design, logo design and marketing promotional materials for the 2016 Catalyst Conference event in Atlanta Georgia Uncommon Fellowship by freelance graphic designer Russell Shaw. Photograph (above) by Phil Sanders, for Catalyst Conference. For the conference theme of its 2016 events, Catalyst chose to focus on a call for unity – a timely message in a divisive year. But not unity in the sense of a striving for sameness. Instead, a collective of unique and different people – a celebration of our diversity. This is a fellowship most uncommon: the story of a family filled with differing backgrounds, but discovering its unity through its pursuit of a common purpose. The logotype is a mishmash of varying weights and typesettings of Catalyst's brand fonts – Flama and Plantin – to create a patchwork lettering system that highlights the message of a collective of unique and different people joined as one. The visual assets are a combination of a series of woven line work that create interlocking tapestries; shapes that show dramatized gradients made with halftone lines to illustrate a gathering and coming together to create a whole; and swirling patterns that creates a messy and imperfect sense of one-ness. The bracket in the Catalyst "C" icon was also used as a pointer to indicate community – turning in on itself, separated by a thin line, it became an icon for the theme, a symbol of overcoming division. 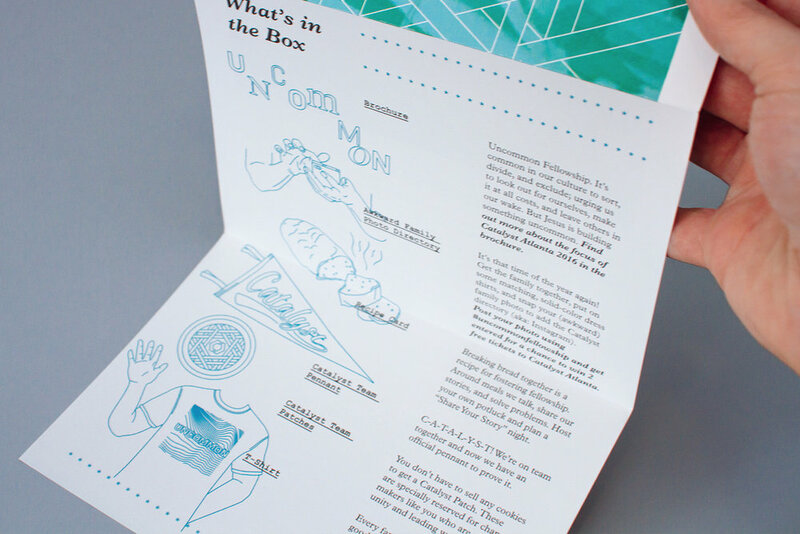 The visual identity design was carried out across a promotional mail campaign – a box of goods shipped to key influencers and group leaders to tease the event's theme – as well as the materials and collateral for the actual event as well. The box was a simple corrugate mailer that was flood-coated with a design so that we could reduce packaging materials and shipping costs. Inside of the box was promotional materials for the event as well as fun items that encouraged participation and some sweet swag. Like an old bulletin, the family newsletter included a welcome letter from the executive director that outlined the theme and invited the viewer to participate. It also included a "What's in the Box?" section which detailed all of the box's contents and what to do with them. The brochure uses a printing and binding technique that seeks to further illustrate the idea of small things coming together to create a whole. The spreads of the brochure increase in width progressively throughout the layout. The result, when bound, is a cover image that is completed by all of the spreads lining up and sitting next to each other. In order to encourage some immediate interaction on social media, one of the items in the box is a small booklet that "educates" the viewer on creating their own "uncommon family portrait." The viewers gather their friends, don some vintage gear, strike a weird pose, and post the pictures to social with a hashtag that helps assemble an uncommon family photo album online. This is just a playful way to encourage participation and reinforce the theme. "Never underestimate the value of a set of clasped hands placed oddly on a friend's shoulder." The event's lanyards use a clear coat, spot UV layer to overlay the solid color namebadge (each color corresponding to a different level of security and/or permission). The overlay effect is the warped line work pattern created as a part of the overall visual identity system. The event notebook, or "notezine," is a soft touch aqueous-coated black book so that, while it features the speakers and some of the sponsors, it functions less like a magazine and more like a personal journal for the attendee to use and take notes throughout the conference. The cover has a debossed, spot UV-coated logo, and the bracketed ">/<" icon across the spine. Editorial graphic design of conference notebook features speaker Judah Smith at Catalyst Conference 2016.